There are hundreds of ideas on how to decorate your backyard, terrace or top roof. And the combination of wooden pergolas and decks has been popular for many years. This says a lot about these two outdoor structures and how they complement one another in the most stylish way. What’s even more essential than high aesthetics is the enhanced functionality. Who will sit on the deck when the sun is not blocked? Or when it’s raining. Isn’t it a pity to let the weather conditions determine your entertainment choices? 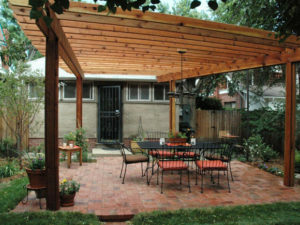 A beautiful pergola over your outdoor decking won’t keep you in the house.